Argulus has a direct life cycle, meaning it only requires one host (the fish) to completely develop from an egg to a mature, reproducing adult. 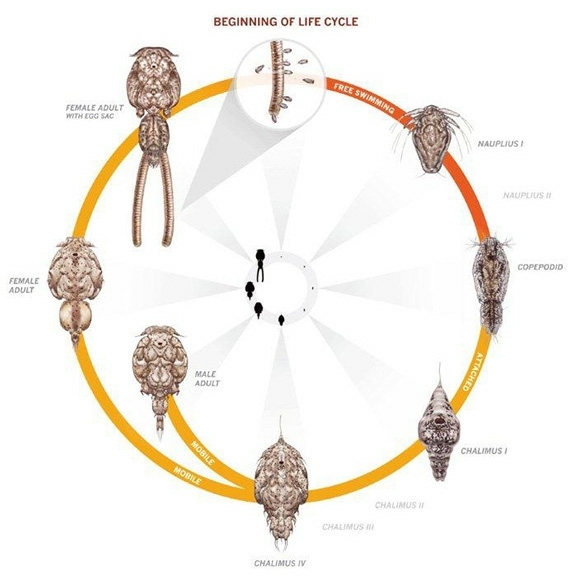 All crustaceans, including Argulus, develop and grow through a complex series of molts (i.e., by shedding their outer surface, or “exoskeleton,” which is made of a compound called chitin) and multiple life stages. 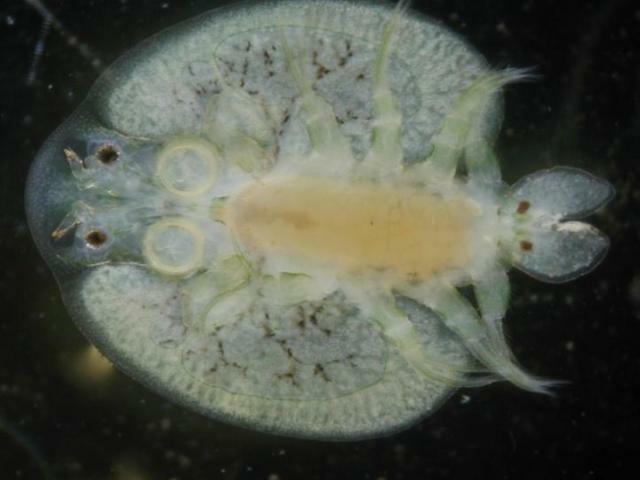 Unlike copepods—another group of crustacean fish parasites, such as Lernaea (the Anchorworm) branchiurans continue to molt periodically even after reaching maturity. Some chemical control methods (see Diagnosis and Management) kill the parasite by inhibiting the molting process. While the branchiuran life cycle averages 30 to 60 days, the actual duration depends on the parasite species and the water temperature. All life stages of both sexes are parasitic—unlike the non-parasitic male Anchorworm (Lernaea), Argulus adults can survive for several days off the fish host. After a male/female pair mates, the adult female detaches from the fish host to lay eggs onto hard surfaces and vegetation in the environment. After she releases her eggs, the female returns to the fish host. The time required for Argulus eggs to hatch will vary, depending upon the species and temperature. Argulus japonicus eggs hatch in 10 days at 35°C but require 61 days at 15°C. 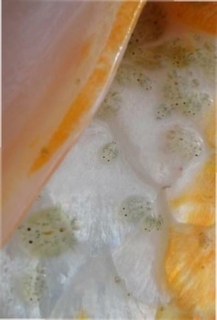 At 23°C the eggs of a closely related species, A. foliaceus, hatch in 17 days, whereas at 20°C they hatch in 30 days. If laid in the fall, eggs are capable of over wintering (surviving) until the following spring. In many species, the first stage larvae (known as the “metanauplius”) must find a parasitic host within 2–3 days of hatching or they will die. Once attached to the fish host, juveniles undergo a series of molts (11 molts or 12 “stages” in A. foliaceus) until they reach sexual maturity, roughly 30–40 days after hatching. Juveniles can overwinter within the fish’s mucus. Argulus is also capable of acting as a mechanical vector or intermediate host for several fish diseases. The parasite can carry and transmit spring viremia of carp, a reportable viral disease of Koi, common carp, and goldfish, among other hosts. Aeromonas salmonicida, an important bacterial pathogen, has been isolated from Argulus coregoni, and experiments demonstrated higher rates of Aeromonas infection when Argulus are present, but direct transmission from louse to fish has not yet been proven. Argulus can also serve as the intermediate host for several species of nematodes (roundworms). 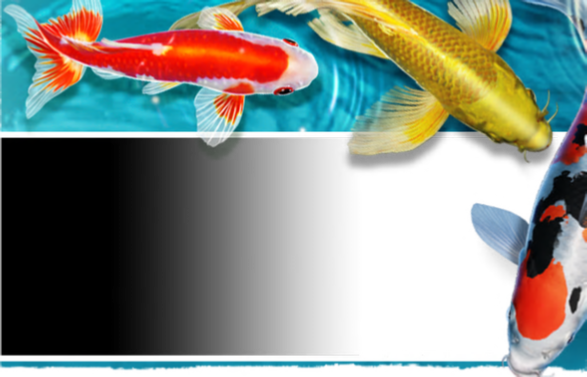 Emamectin benzoate (SLICETM, Merck Animal Health) is an in-feed product that has been shown to experimentally control Argulus infections in goldfish and koi. Emamectin is licensed outside the U.S. for control of sea lice, a saltwater copepod parasite; however, in the U.S. emamectin is an FDA Investigational New Animal Drug (INAD) and, therefore, is currently unavailable for general use. Those interested in its use must contact the manufacturer and enroll in an INAD study. Of all the drugs listed above, only potassium permanganate (in freshwater) is legal for use in fish intended for human consumption, and its effectiveness may not be ideal. There are currently no approved products for use in food fish species. Consequently, it is critical to know where your fish are coming from and to quarantine new fish before introducing them to your system. 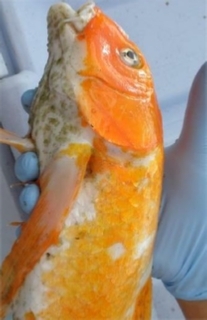 Potentially infested fish should not be mixed with clean fish without a proper quarantine. Because of potential challenges with controlling this parasite, especially in food and pond fish, bio security measures should be instituted and followed to minimize introduction or transmission to other ponds, systems, or facilities. Argulus infestations are not uncommon in wild or pond-raised freshwater and marine fish. Because infections can rapidly escalate, causing disease and mortalities, management and treatment are recommended as soon as Argulus is identified. While several effective treatments are possible, availability, legalities, logistics and fish species’ sensitivities should be considered. The best way to avoid an Argulus infestation is through good bio security, including screening and quarantine of incoming fish, and continuous observation of all fish.